Preheat the oven to 425°. Lightly grease a large baking sheet. In a bowl, combine the flour, polenta, baking powder, sugar and 1/2 teaspoon each of salt and pepper. Using 2 table knives, cut in the butter until the mixture resembles coarse meal. Add the cheddar, then stir in the milk until the dough is moistened. Using 2 large soup spoons, scoop 8 mounds onto the baking sheet. Lightly press down on each mound. Bake the biscuits for about 19 minutes, until the tops are golden and the bottoms are browned. Transfer to a wire rack to cool slightly. In a mini food processor, pulse the scallions, celery and jalapeño until finely chopped. Add the ham; pulse just until finely chopped. Pulse in the mayonnaise and mustard; season lightly with salt and pepper. Slice the biscuits; fill with the salad; serve. 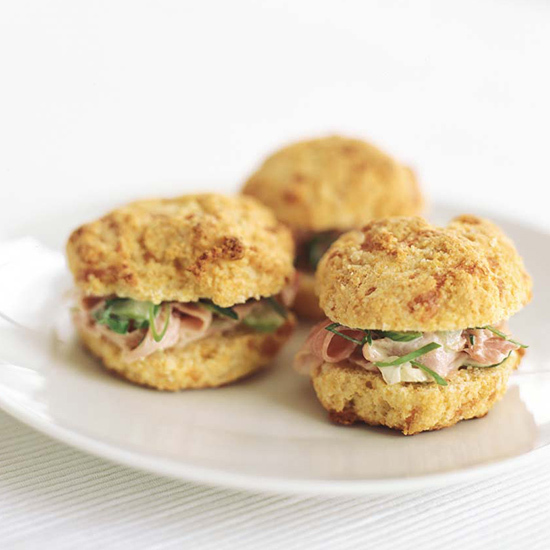 If you don't have time to make the biscuits, the ham salad is terrific served on pita chips or crostini cut from a baguette.